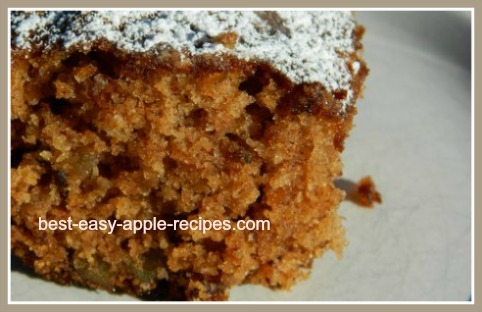 This Gluten Free Apple Squares Recipe not only tastes scrumptious, but it's a quick and easy apple recipe without wheat flour too. My friend Lorraine, who, by the way is an amazing cook and baker, and makes all sorts of gluten free food, sent me this recipe and photo! Make these squares in a 9" square baking dish, or why not double the recipe and make two? With a flavour and texture like these they won't last long! In a large bowl, combine the butter, eggs, sugar, baking soda, vanilla, cinnamon and flour and beat until well mixed. Add the chopped apple pieces and the chopped nuts. Transfer batter to a greased, 9" x 9" baking pan. Bake at 350° F for 40 to 50 minutes or until a toothpick inserted into the center comes out clean. Sift icing sugar over the top. Makes 12 - 15 squares. This recipe is adapted from a recipe in "150 Delicious Squares" by Company's Coming. Did you know that there are over 7,500 different varieties of apples grown all over the world? Did you also know that apples belong to the "rose" family?